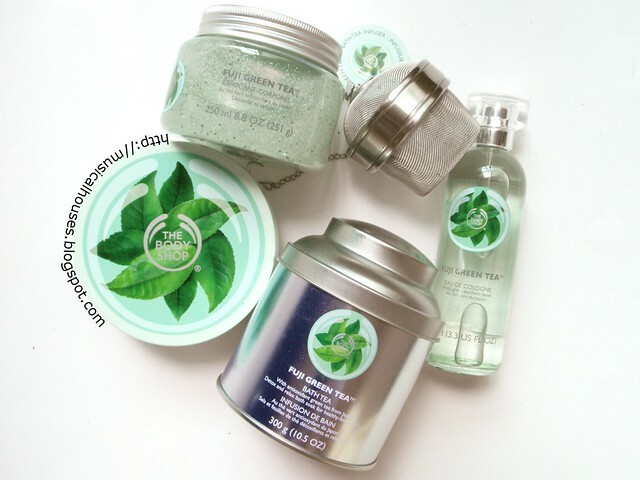 The Body Shop's Fuji Green Tea Collection, consisting of a Body Butter, Body Scrub, Eau de Cologne, and Bath Tea, has been getting quite a bit of raves from both bloggers and customers alike. I'm pretty late to the party (considering that this collection was launched here in April-ish? ), but I figure better late than never, right? Right? Anyway, let's skip the preliminaries and get to the review. 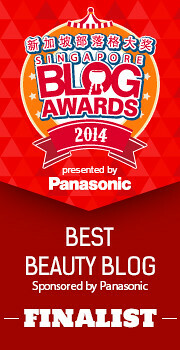 There are 4 products I have to review, so it's going to be a long post! Buckle up and let's go! First, let's start off with the Fuji Green Tea Body Butter. 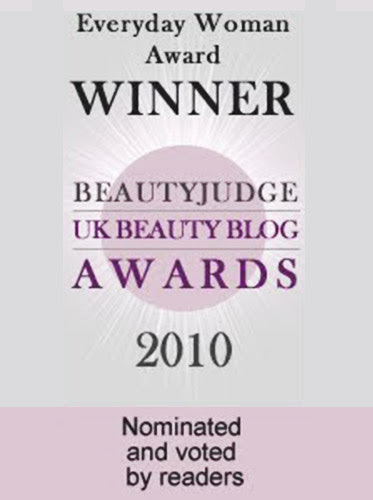 The Body Shop's Body Butters are an old staple of the brand, so I don't have too much to say about these - if you like their Body Butters, you'll like this! Also in the same container, with a refreshing, citrusy scent with a hint of green tea. And also in the same plastic container we know and love. As you can see from the ingredients list, the key components of the product are water, as well as humectants (Glycerin, Panthenol), emollients, some of which are plant-based, like soybean oil, shea butter, and brazil nut oil (Glycine Soja Oil, Cetearyl Alcohol, Ethylhexyl Palmitate, Myristyl Myristate, Butyrospermum Parkii Butter, C12-15 Alkyl Benzoate, Bertholletia Excelsa Seed Oil). Some of the emollients also double up as thickeners and the like. 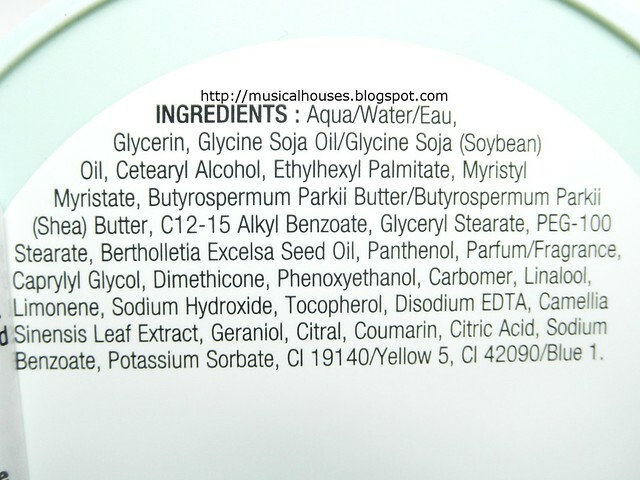 Then there are also emulsifiers (Glyceryl Stearate, PEG-100 Stearate) as well. If you're wondering where the tea is, it's among the plant extracts that are listed further down the ingredients list, so it is present, although perhaps not in very high amounts. 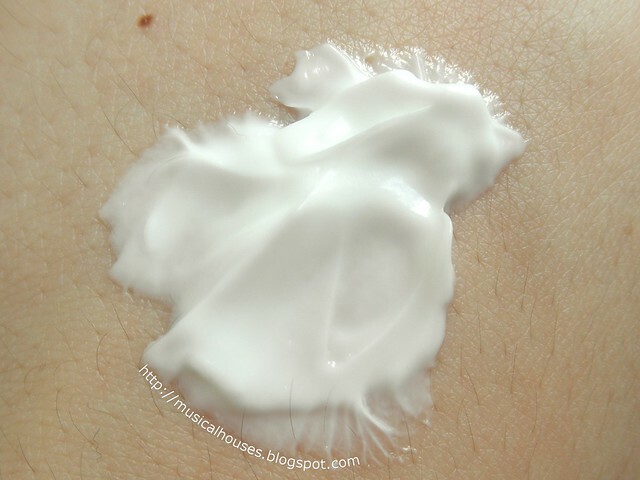 So from the ingredients list, we can gather that this is a fairly emollient-heavy formulation, which means that it will indeed prevent TEWL (transepidermal water loss, or, in layman terms, just water loss from the skin). This in turn means that it will be very effective at preventing your skin from drying out if you have a compromised skin barrier, or are subject to harsh weather. Of course, the downside is that the product will be on the thicker side - that's essentially what a Body Butter is, isn't it? Nevertheless, if you don't mind a thicker formulation, this is a solidly formulated body moisturizer. 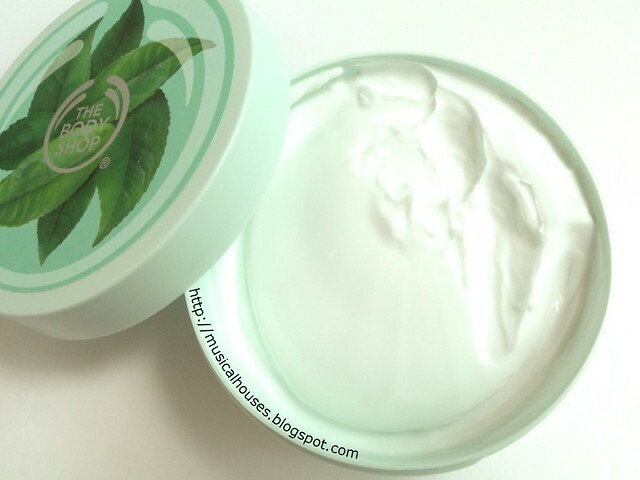 The Body Shop Fuji Green Tea Body Butter is indeed, as expected, a thick cream. It does absorb into the skin, and it feels nice and very luxurious. It may not be the most suitable body moisturizer for very hot and humid climates (if you want to use it in tropical Singapore, I'd advise you to use it sparingly if you're not in an air-conditioned space), but it's great if you're in an air-conditioned area or in colder weather. 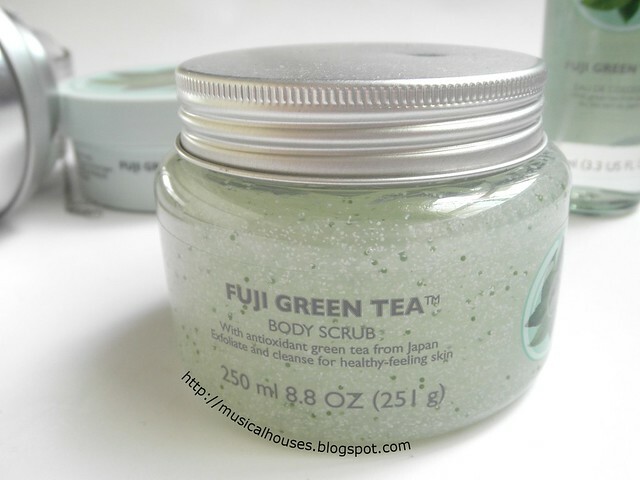 On to the next item, The Body Shop Fuji Green Tea Body Scrub. This is, as the name suggests, a nice gel with scrubby bits in it, in a jar form. 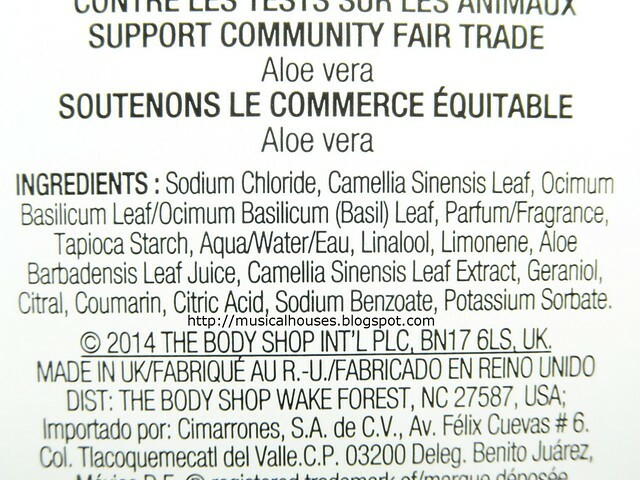 According to The Body Shop, it also contains fair trade honey from Ethopia. Looking at the ingredients, this is a pretty simply formulated scrub - the main ingredients are water, Glycerin, a humectant, and PEG-40 Hydrogenated Castor Oil, an emulsifiers with emollient properties. 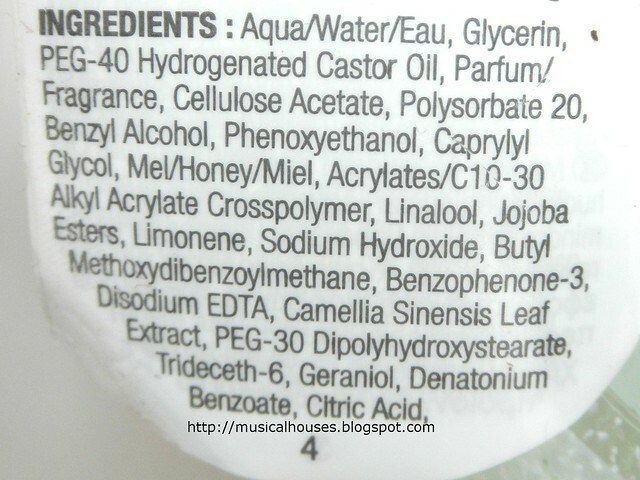 After this comes the fragrance ingredient, so the rest of the ingredients aren't present in very large amounts, which include the Honey, as well as various functional ingredients like film formers and polymers (Cellulose Acetate, Acrylates/C10-30 Alkyl Acrylate Crosspolymer), emulsifiers (Polysorbate 20, PEG-30 Dipolyhydroxystearate), preservatives (Benzyl Alcohol, Phenoxyethanol), and the like. And of course, the beads, which are what gives the scrub its exfoliating properties. There is, also, green tea leaf extract (Camellia Sinensis Leaf Extract) for those who are wondering, listed further down the ingredients list. 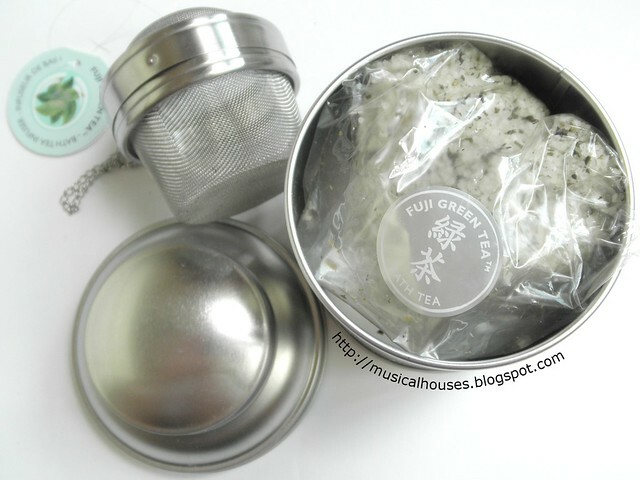 So from the ingredients, we can deduce that the Fuji Green Tea Body Scrub is a pretty moisturizing product with both emollients and humectants, but not so much that it feels heavy. The moisturizing and emollient properties are always useful in a scrub, because it helps to lessen the abrasion from using a physical scrub. 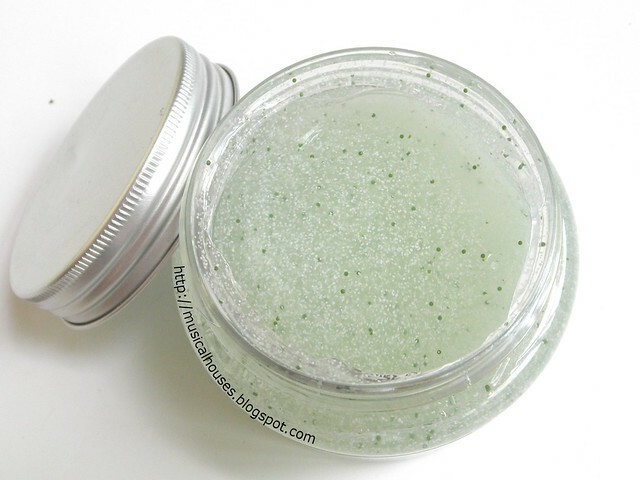 As you can see, the product itself is a nice, light clear gel, with white and green scrub beads. Although I'm not personally a fan of physical exfoliation on my face, I'm just fine with physical exfoliation on my body. The beads in the body scrub are round, smooth and even, rather than jagged with sharp edges, and therefore quite comfortable to use. So this is pretty gentle even as it exfoliates. Next, we have the Fuji Green Tea Eau de Cologne. Not too much to say here, it's a nice cologne in a spray bottle. The scent is actually primarily citrus, and very refreshing, with notes of green tea and the slightest hint of herb. This is a great unisex scent, as it would smell equally good on both males and femals - a citrus-based freshness is always a welcome note to any fragrance! I thought the scent would fade fast, since citrus notes tend to not have much longevity, but this actually stayed on for a pretty decent amount of time. I also liked that the citrus not is not a total blasting assult to your nose, like so many citrus-based scents tend to be, but is paired off fairly well with the other scents so as to make it less in-your-face. I can't imagine anyone being offended by this, and the scent is safe enough to wear to work. 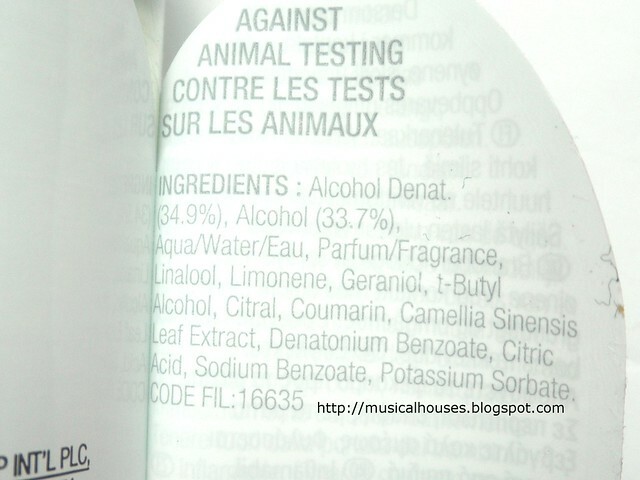 The ingredients for the Eau de Cologne are quite typical of most perfumes. Alcohol, Water, Fragrance, and other citrus fragrance ingredients, like Linalool, Limonene, Citral and the like, as well as Camellia Sinensis Leaf Extract. 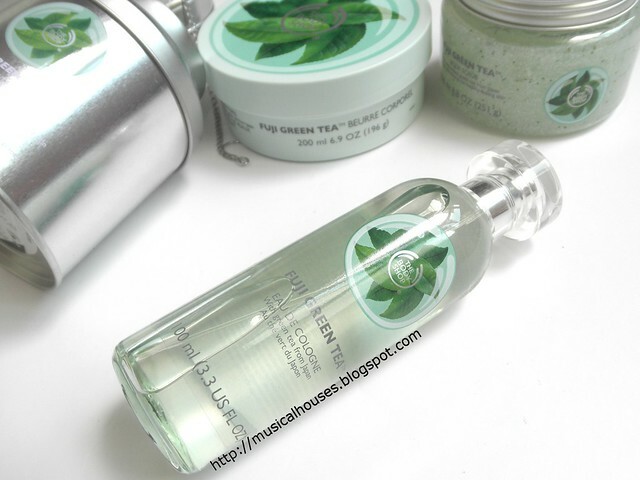 Lastly, let's look at The Body Shop Fuji Green Tea Bath Tea! 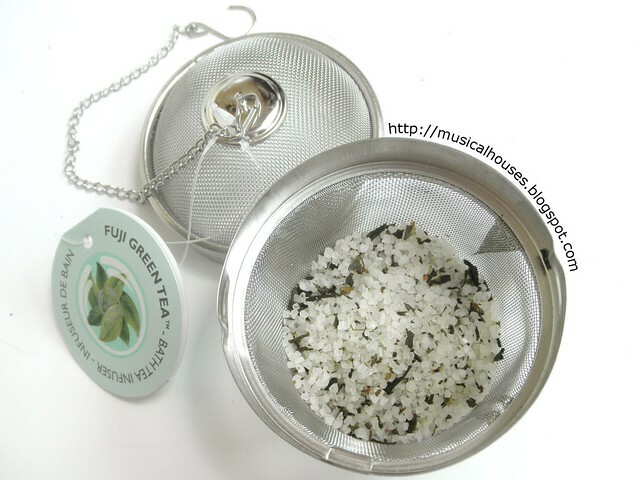 This is perhaps the most ingriguing product of the Fuji Green Tea range, because it looks like a little tin of tea, but it's actually for your bath! You get a tin of "tea", which is really more like bath salts with tea leaves, and you also get a little Bath Infuser, or "steeper" (bought separately) that you can also use for your bath. The way the bath salts are packaged, like a tin of tea, really adds to the appeal. Visually, the little bits of tea leaves are also pretty cool, too. To use, simply scoop out some of the bath tea into the bath infuser, and you can start using it in your bathtub! I recommend that you get the bath infuser (unless you have your own), because just using the bath salts by itself can end up making your tub a little messy. Also, depending on the size of your tub, you might find that you need to adjust the amount of bath salts you use to see an effect in your bath. So, if you really want a good soak, you'll need to be generous with the amount you're using. That said, it really smells great and invigorating, and is a nice mix of citrus and tea and herb. Looking at the ingredients, again this is a pretty simply formulated product - the three main ingredients are salt (Sodium Chloride), tea leaf (Camellia Sinensis Leaf), and basil leaf (Ocimum Basilicum Leaf). After that is the fragrance ingredient, along with a bunch of other minor ingredients, that are primarily citrus fragrance ingredients (Linalool, Limonene, Geraniol, Citral), green tea extract (Camellia Sinensis Leaf Extract), preservatives (Sodium Benzoate, Potassium Sorbate), and so on. So yup, as far as this product goes, what you see is what you get - salt, tea leaves, and basil leaves. 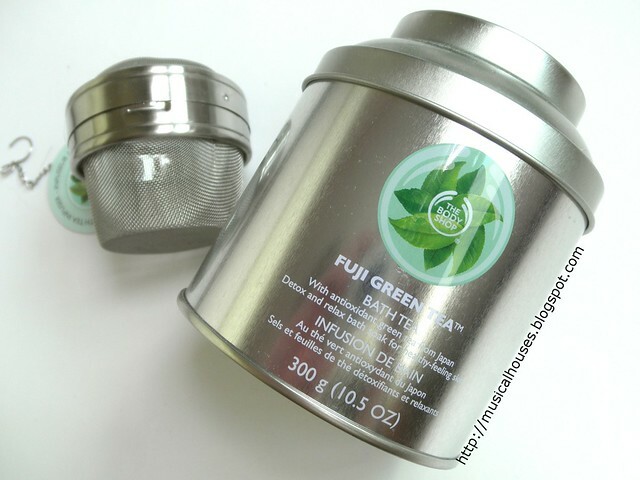 The Fuji Green Tea Bath Tea is definitely my favourite item in the range, just because it's fun to use, and pretty cool. Perhaps the only downside is that I don't actually sit in a bathtub all that often (in fact, for me it's a rare occasion), so I don't think I'll get to use this often! Perhaps I should bring it with me on my next holiday, and use it in the hotel. 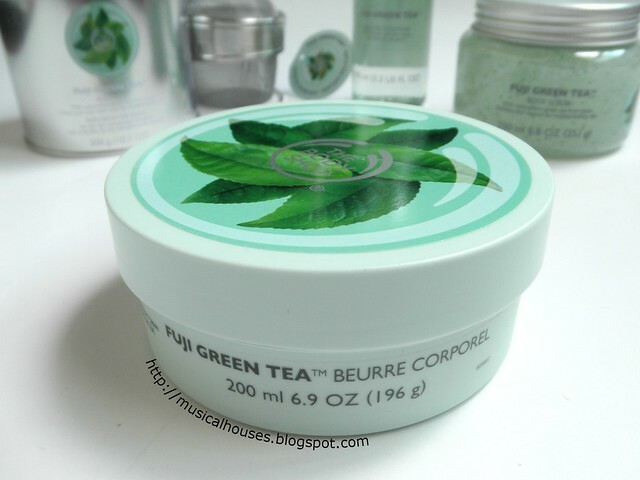 So, would I recommend The Body Shop's Fuji Green Tea line? Based on the products I've tried, I think so! The formulation of the products is sensible and solid, and the Body Butter, Body Scrub, and Eau de Cologne all live up to what we expect of The Body Shop, and serve their purpose. The Body Butter is emollient and moisturizing, the Body Scrub exfoliates while still moisturizing the skin, and the Eau de Cologne is appropriately fresh and suitable for both ladies and men. 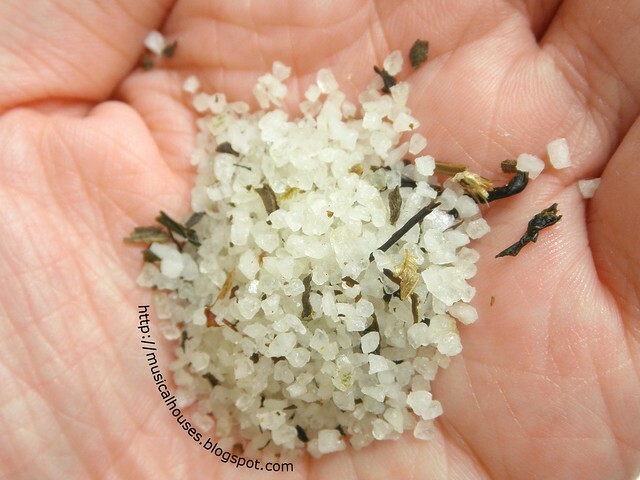 The Bath Tea is also a great product, with its novel appearance and strong, uplifting scent. So whether you're looking for a body moisturizer, a scrub, a scent, or bath salts, the range is worth checking out. 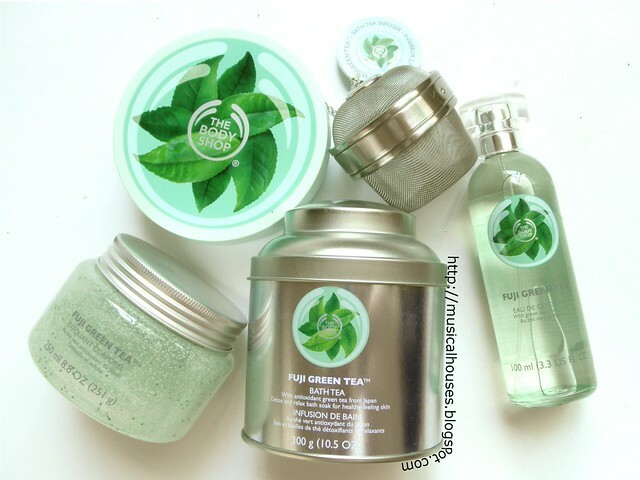 The Bottom Line: The Body Shop's Fuji Green Tea range consists of products that are formulated nicely, and aesthetically pleasing to use. Extract of green tea hardly counts as green tea. Does green tea even have any benefit applied to the skin? However, I do like green tea scent though it's prob. synthetic. 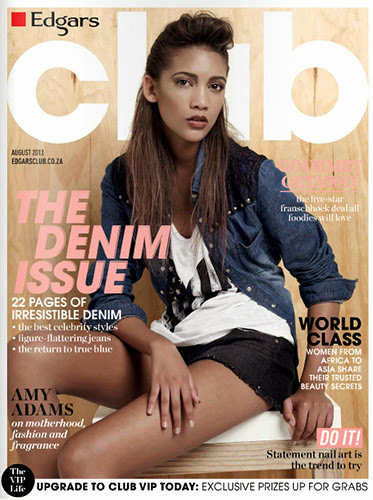 And the aqua colour is pretty. @Mary Pang: There is some indication that green tea could have antioxidant benefits, but I think the product is formulated in such a way that the green tea extract is a nice add-on to a good skincare base. So if you're not keen on the green tea part of the product, the product still stands on its own merit, I think. Hope this helps! 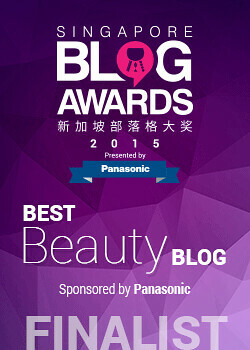 Explored your blog today via Google and regret not knowing it earlier. Anyways, I'm loving it already :) Btw, does your skin feel any change after using that scrub?